Anyone who’s been to a camping-festival in the last decade is most likely well acquainted with the live performances of Michael Franti and his globally-inspired messages of love, unity, peace, and protest. The singer and political activist has been criss-crossing the nation barefoot for over 10 years, developing a tightly knit grassroots fanbase. But since the release of All Rebel Rockers and the single “Say Hey” in 2008, plus the recent tour with Grammy winner John Mayer, Franti and his multi-faceted backing band have reached commercial heights unexpected for such a politically outspoken group of artists. Having just released The Sound of Sunshine in late September, Michael Franti & Spearhead are once again amidst a massive North American Tour. But as “The Sound Of Sunshine Tour” blew through Chicago, I was left wondering, “With all the new fans, is Michael Franti still going to be Michael Franti?” Not to question the man or the band, but the live experience. Through his music, stage conversation, and pure aura, Franti has a way of making every show seem like an intimate experience, bringing the entire crowd together. But would the new fans, drawn by the singles, appreciate the performance? Walking into Chicago’s Riviera Theater it was unmistakable that the sounds of the beach had been imported to the Midwest. But openers Tamarama’s stoned-out surf rock doesn’t originate from sunny Southern California, they’ve made the trek from Sydney, Australia. Though unfamiliar with the band, one member was oddly recognizable – lead singer Jay Lyon. Or if you’re into MTV “reality” programming, White Port’s ex-flame from The City. But just because the band was a plotline doesn’t mean they can’t make good music. Lyon and fellow bandmate Nicolas Potts obviously have experience working the camera. 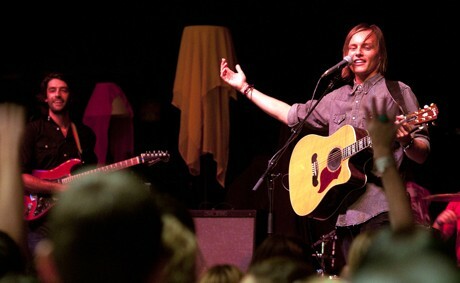 While the duo, who are supported by a rhythm section while on tour, do little to differentiate their sound from artists like Jack Johnson and Jason Mraz, they use their charisma as a hook in the live-setting. Fans couldn’t help but sing-along when they strummed in fan favorite Bobby McFerrin’s “Don’t Worry Be Happy”. The audience shared in a collective flashback of sixth grade summer camp. For their first time ever visiting Chicago, the duo proved there is some substance. Lyon and Potts share vocal duties, their Australian accents adding an odd bit of authenticity to their beach ready tracks.When Tamarama broke into the new driving pop-rock track “Wasted on You” it seemed the duo aim to expand from their folk roots and create a more accessible sound. As Tamarama’s set concluded, the Riv began to fill in anticipation for Michael Franti. 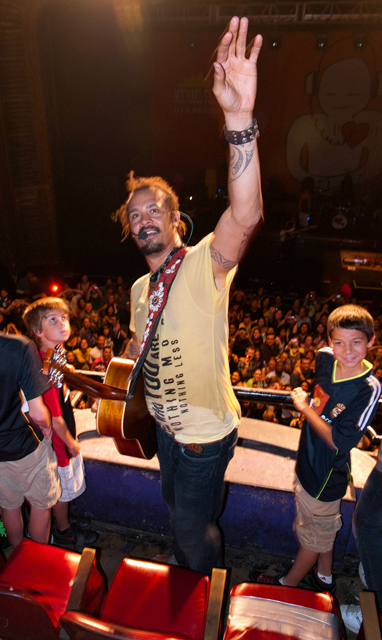 Despite not taking the stage until 9:20, immersed within the eclectic group of 20 and 30 some-things was a large number of children with their families – just an example of the expanse of Michael Franti & Spearhead’s fanbase. To define Franti’s sound is almost as difficult as describing a typical fan. Based around reggae and folk-rock, Spearhead’s members have the ability to span a range of genres, and the group takes full advantage of the live setting to tout their skills. Each member showcased his skills Friday night in Chicago, but nothing could cast a shadow on the evening’s performance by Franti. When not playing the acoustic guitar, Franti spent the time between verses dancing around the stage, transmitting a seemingly endless amount of energy to the audience. 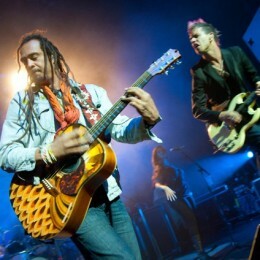 That evening, Franti continued his reputation as one of the most genuine artists in the industry. During “Shake It”, Franti brought the front row on stage, and spent a bit of time dancing with each of them. But nothing could prepare fans for the amount of interaction that occurred for “Hey, Hey, Hey”. After “Yell Fire”, Franti disappeared, only to re-emerge amidst the second story audience, surrounded by a group of young male fans. After a few moments of coaching, Franti broke in to “Hey, Hey, Hey” with the group, and then made his way through the sea of people — guitar in hand. Every member of the audience felt connected to Franti, and united with one another. He created an organic environment where fans are insulated from the troubles of their day. After the track “I’ll Be Waiting”, which sounds remarkably like a track supplied by Cat Stevens and U2, the band broken into “I Got Love for You”, culminated in an epic jazz drum solo. After telling the story of his adoption, and his mother’s childhood lessons of equality in a mixed race household Franti began the newly penned “Love Somebody”. In the vein of classic tracks by 196o’s protest singer/songwriters, “Love Somebody” is a message of freedom. Freedom to love and marry whom ever one chooses, no matter the sexual orientation. The show ended with audience favorite “Say Hey”. But Franti, couldn’t do it all by himself. He invited every child and adult above the age of 60 to the stage, and even handed over the microphone so a young girl, barely up to his waist, could sing the chorus. The spectacle was truly awe-inspiring, and made several members of the audience wish we were 8 again. By the end of the night, my initial question had a resounding answer: Fame and all, Michael Franti is still Michael Franti. As such, the audience couldn’t leave without a moment of social awareness. Franti explained that fans have the ability to provide shoes for youth all over the world just for a dollar per pair. With the weather being pleasant, fans even had the option to donate their shoes upon exiting. For those that fear walking through the streets of Chi-town barefoot, text Franti to Souls4Soles (20222) to automatically send $5 to the cause.